As a newcomer to Google Ads, finding keywords might be a great deal. However, like many advertisers, if you too have devoted much time and energy building your keywords list while ignoring negative keywords, you are losing an important part of your strategy. In fact, according to research, almost half of advertisers don’t add a single negative keyword to their accounts. Negative keyword list plays a crucial role in maximizing the ROI of your Google Ads campaign. Here’s how you can get started if you haven’t used much around the negative keyword list. 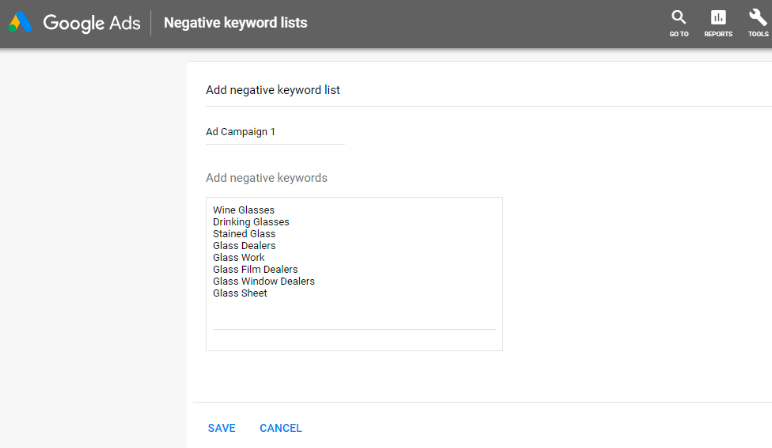 Negative keyword list let you exclude selected search terms from your campaigns. This helps you focus on highly targeted keywords bringing in better and niche audience while also increasing your return on investment (ROI). The key to a highly targeted campaign is choosing what not to target. When selecting negative keywords for search campaigns, look for search terms that are similar to your keywords, but might cater to customers searching for a different product. For example, let’s say you’re an optometrist who sells eyeglasses. While your search terms can include glasses, make sure you have added search terms like “wine glasses” and “drinking glasses” in your negative keywords list. If you’re using Display or Video campaigns, negative keywords can help you avoid targeting unrelated sites or videos, but keep in mind that negative keywords work differently for Display and Video campaigns than they do for search. Depending on the other keywords or targeting methods in your ad group, some places where your ad appears may occasionally contain excluded terms. For Display and Video ads, a maximum of 5,000 negative keywords is considered. You can also avoid targeting unrelated sites or videos by implementing site category options and content exclusions. For search campaigns, you can use broad, exact, or phrase match negative keywords. However, these negative match types work differently than their positive counterparts. The main difference is that you’ll need to add synonyms, singular or plural versions, misspellings, and other close variations if you want to exclude them. For Display and Video campaigns, negative keywords are always considered an exact match. You won’t be able to change the match type for negative keywords you add to Display and Video campaigns. This type is the default for your negative keywords. For negative broad match keywords, your ad won’t show if the search contains all your negative keyword terms, even if the terms are in a different order. Your ad may still show if the search contains only some of your keyword terms. For negative phrase match keywords, your ad won’t show if the search contains the exact keyword terms in the same order. The search may include additional words, but the ad won’t show as long as all the keyword terms are included in the search in the same order. For negative exact match keywords, your ad won’t show if the search contains the exact keyword terms, in the same order, without extra words. Your ad may still show if the search contains the keyword terms with additional words. The Keyword Planner is intended to help you find the right keywords to bid on and take back great ROI in return. Still wondering why visitors aren’t converting? Start working on expanding your negative keyword list, probably that will help. We help you scale your SEM efforts.